[whohit]Opening Page[/whohit] You may have noticed the above logo on my leather projects. The logo literally translates from ancient Phoenician (Proto-Canannite), “Behold Truth.” Read further to see how I arrive at this translation. From right to left, Aleph Mem Tav is the Hebrew word Truth. Hey means behold. Before reading the complete description, examine the meanings of the following letters, then compare to the logo. In English, the letter A has its origin with the Phoenician letter Aleph. Phoenician (Abraham’s language) is the root language for modern Hebrew (paleo-Canaanite). 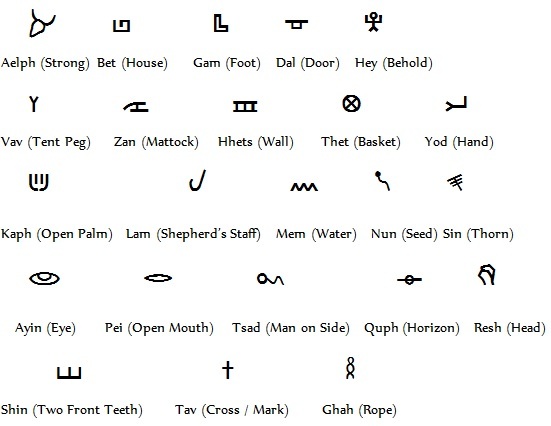 ‘Aleph’ in Phoenician is the pictograph of an Ox and means strength. ‘Mem’ means water. ‘Tav’ means a mark. Tav is the last letter of the Alephbet (Omega), while Aleph is the first (Alpha). In the last book of the Bible, Christ calls Himself the Aleph Tav, or Alpha and Omega (beginning and end). Tav is the mark of the cross (plowman’s mark), while the Hebrew word sin (Chet) is defined as missing the mark. The Aleph Tav is the mark of the plowman reaching the end of the furrow, pulled by the Ox. Reversing the letters makes the word Point / or Mark to be reached. Bet Aleph Tav means coming to the mark. This is the turning-point of faith in a person’s life. Together, the three letters of Aleph Mem Tav mean Truth, or Emet. Literally defined, they mean Strong Water Mark. The water mark belongs to believers hitting the mark of truth through faith. The mark missed is the animal nature (selfishness). In English, we get our word alphabet from the word Father, or Abba in Hebrew. Abba has the root spelling in Hebrew (AB) Aleph Bet, or Strong House. What writes a Word of the Son? Sequences of letters (AlephBet), or the Father of the Son writing the Word (DNA). Why is the Father (Aleph Bet) of the Word important? The Aleph Bet (DNA) writes the Word. The word mother in Hebrew is Aleph Mem, or strong water. She is the cup holding the seed in the oven (womb). The word Son is Bet Nun (Ben), or House of Seed. The Son is the House of Seed, or one continuing the House of the Father. Son in Phoenician looks like an opening for seed (Bet Nun). DNA is the primary example of this process moving letters to words using water as a catalyst. The mother is the womb of the process. In Latin, she is Mater, or our English word Matrix (womb). Put it together. The seed in a cup with yeast is mixed with water. It then bakes in the oven (womb) to make the bread of life. This is proof God left his Strong Water Mark on mankind. Humans did not have this information when the letters of Phoenician were written. What does all of this mean? 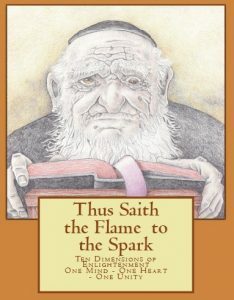 The word Truth in Hebrew is Aleph-Mem-Tav, or EMET. Taking away the Aleph (Strength) makes the word MET, or death. The strength of any process requires the parts that come before. The logo is my reminder to take care hitting the mark of any project I undertake in life. Missing the mark reveals itself in the product at the end (Tav). This is the mark of the craftsman (Architect / Builder) and a reflection of what has been informed. Hitting the Mark (plowman’s mark) is required for a straight furrow to the end of life. The pictograph that looks like a man holding his arms to God is the letter Hey. Hey means behold. If we examine this letter in English, we see its significance. Look at the word Ear. An ear can be the organ used for hearing, but also a seed that must open in soil. For ears to open, information must be informed, or formed within the soil. Adding the letter Hey to Ear gives us the word Hear, or seed opening in soil. In the Bible, Abram listened to God and became Abraham. His arms were open to truth. Adding the letter Tav gives us the word Heart. The heart is the soil for open ears hitting the mark of truth. Moving the hey to the end of Heart, we get Earth, or the soil for ears of grain. The Earth is where you behold. Why do Phoenician letters define English words? The Tree of Knowledge holds the letters. The fruit falls from every language. I could easily do this same thing in German, but I will save this for another blog post. Coming (Bet Aleph Tav) to the Father (Aleph Bet / Letters) requires the Word. Jesus answered, “I am the way and the truth and the life. No one comes to the Father (Aleph Bet) except through me (Word). The Letters hold the key to knowing the Father’s complete plan for humanity. Behold by Faith. Examining the Hebrew root for the word ear, we also see the words balance and Hear. Within the cochlea of the ear (which looks just like a Hebrew Bet-House), there are two chambers for fluid (endolymphatic). Without these, we could not keep balance. Word 1152, Harvest, is made of two letters (Zan Nun). Zan is the pictograph of the cutting tool and the seed. ”One of the many agricultural tools was a hoe or mattock. This implement had a wide blade for cutting a plant stalk at the roots. The crops were harvested for a supply of foods, which were stored in jars.” Connected to this branch of word 1152, we have the word Balance. ”The broad ear for picking up sound.” Connected directly to this word, we have the word Whoredom, or, “in the sense of being spread broad. In this case, the seed is being spread in other fields. We also have the word Hear, or listening or paying attention. Hi! WOW I am so impressed w/your creativity and work. I have my mom’s old upright piano and it is an old friend that I grew up with so it is so nice to see that it can be restyled and functional as a desk, (which is something I have always thought about). Do you post how to videos? or would you be able to do turn my piano into a desk? I live in OK. Anyway be great ! And if not, thank you for the inspired webpage!